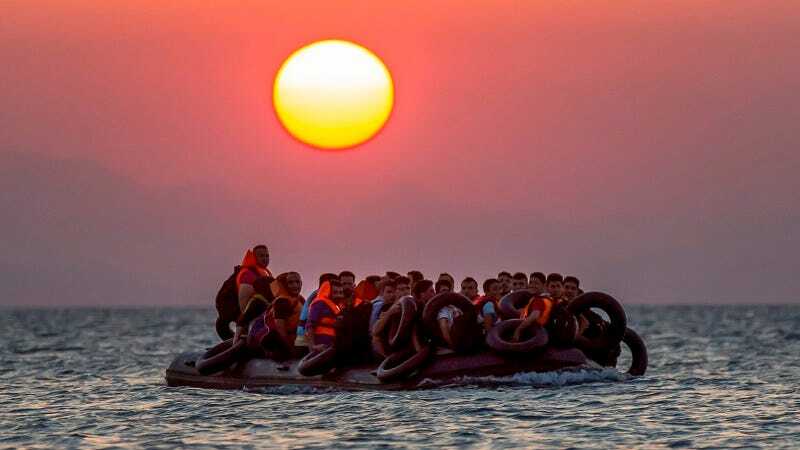 According to a report from the charity Migrant Offshore Aid Station (MOAS), a two-year-old boy has sadly become the first known victim of the refugee crisis in the new year. Buzzfeed reports that the toddler—whose name and national origin are currently unknown—was on board a small dinghy with his family and more than 30 other refugees. The dinghy crashed on the rocks of the Agathonisi, a relatively remote island in the Aegean, on Saturday. MOAS charity worked to pull survivors from the wreckage after local fishermen alerted the Greek coastguard. MOAS said 11 people were injured upon the sharp island rocks among the “wet, bleeding refugees,” while a three-month-old boy was suffering from hypothermia. The AFP news agency said the toddler who died was two, and that his mother was among those who survived. AFP said 39 people survived the dinghy capsizing while MOAS said 35 people had been rescued. Despite the danger, Syrian refugees, in particular, continue to make the five-hour crossing across the ocean and into Greece. The New York Times estimates that more than 200,000 people have been killed in the country’s four-and-a-half year civil war. Migrants on a dinghy arrive at the southeastern island of Kos, Greece, after crossing from Turkey, Thursday, Aug. 13, 2015. Image via AP.